Isabel Fuentes: Love is a gift, Alex, not an obligation. 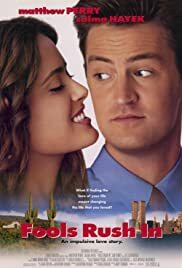 Overall, Fools Rush In follows the same formula of any romantic comedy - Two people fall in love and then a problem arises that breaks them apart for a period of time and then eventually one of them wakes up, the problem is resolved, they say I love you and live happily ever after. - I know, but I still absolutely love this film. There's just something so delightful and enchanting about it. Matthew Perry and Salma Hayek are both so loveable and the story is fresh and vibrant with a big heart. It's one of my all-time favourite movies.